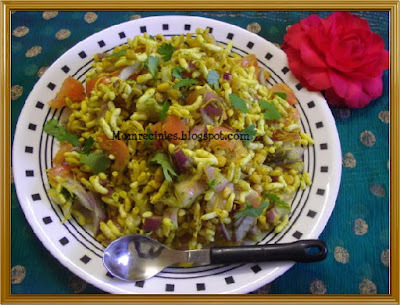 BhelPuri is a very famous and tasty chaat that one can find anywhere in India.Bhelpuri is a sweet and spicy combination of puffed rice, onions, tomatoes, puri, sev, coriander, chillies and chutneys. Everyone has a different style of making bhel. 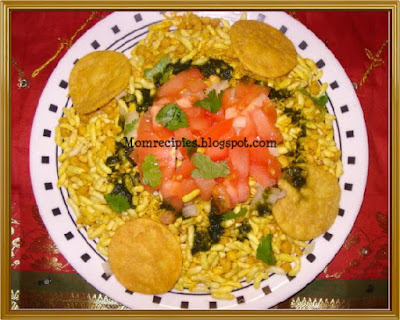 Any version of this dish is delicious and lip smacking.Bhel puri is my all time favorite chaat. 1) In a medium bowl, mix together Puffed Rice, Onions, Tomatoes, Raw Mango, Cilantro red Chilli Powder,salt,green chillies and peanuts. 2) Add Tamarind Chutney and Green Chutney according to your taste. Remember that Tamarind Chutney is sweet and Green Chutney is hot and sour. 3) Lightly crush and add the nimkis / puris. 4) Mix well and serve immediately by garnishing with chopped coriander leaves and sev. 1) Depending on the freshness of your puffed rice, you may want to lightly roast the puffed rice in a skillet to make it crispy. 2) You can store these chutneys in a container and keep refrigerated. 3) Bombay Bhel puri mix is available in the stores, just buy that and add chutneys and ingredients of your choice. Bhel puri is my favorite and I have it whenever I feel half filled. The presentation is good. We have a thela near the house in cochin named "yadav bhel puri wala". We often have bhel puri from there. Looks really great.. nice click.. my fav dish..